Everest Base Camp Trek via Jiri is a world famous trek that follows a classic trail to the Everest Base Camp. This trail existed before the Lukla airport was built. 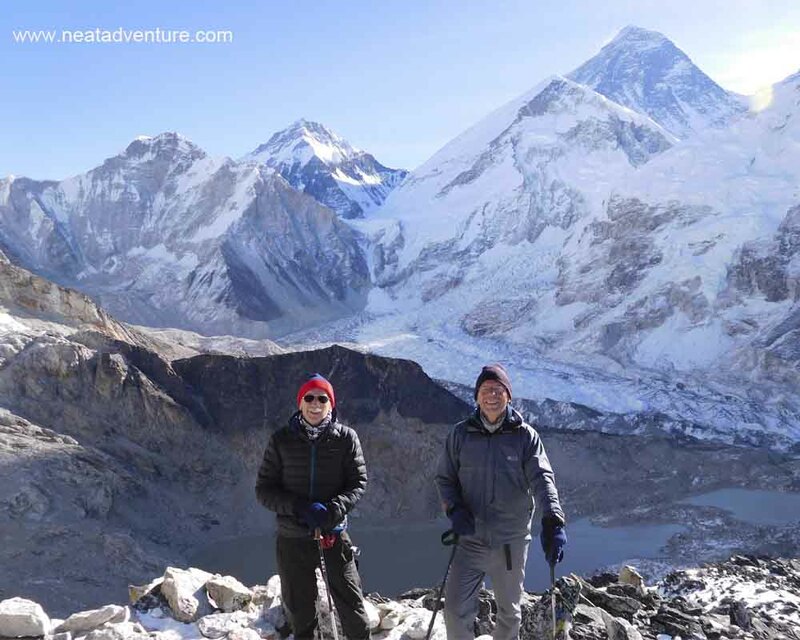 Everest Base camp trek via Jiri is the original route to Everest and it offers the most spectacular scenery above any other routes that lead to the base camp. 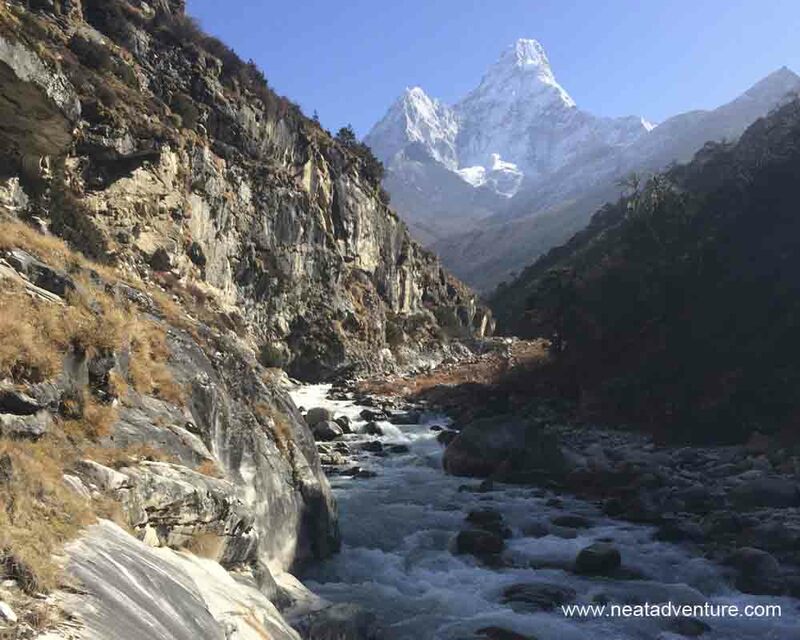 This Trek is very scenic trek and offers the hikers superb views of the world’s highest peaks, including Everest, Lhotse, Thamserku, Ama Dablam and other snow-capped giants. Arrival in Kathmandu - You will be warm welcomed at airport by NEAT Airport representative and then you will be transfered to your hotel. Our trip advisor will brief you about your programs. This day, you can have a rest at the hotel or enjoy the walk near by your hotel to get familiar with Nepalese life style and living. Kathmandu to Jiri 1950m, drive 9/10 hrs Scenic drive along the way via Dhulikhel, Dolalghat, Mude, Charikot, Tamakoshi & Nepal countryside living life style. Lunch at Mude and Overnight at guest house in Jiri followed by dinner. Sete to Juni-Benshi 2675m, 7 hrs Trek begins with a long but continued climb which rest from yesterday to the Lamjura la pass at 3530m. We are delighted with frost and often snow along the trail in winter & rhododendrons in the spring. The Lamjura pass is the highest point between Jiri and Namche Bazaar, before the pass we will have lunch. 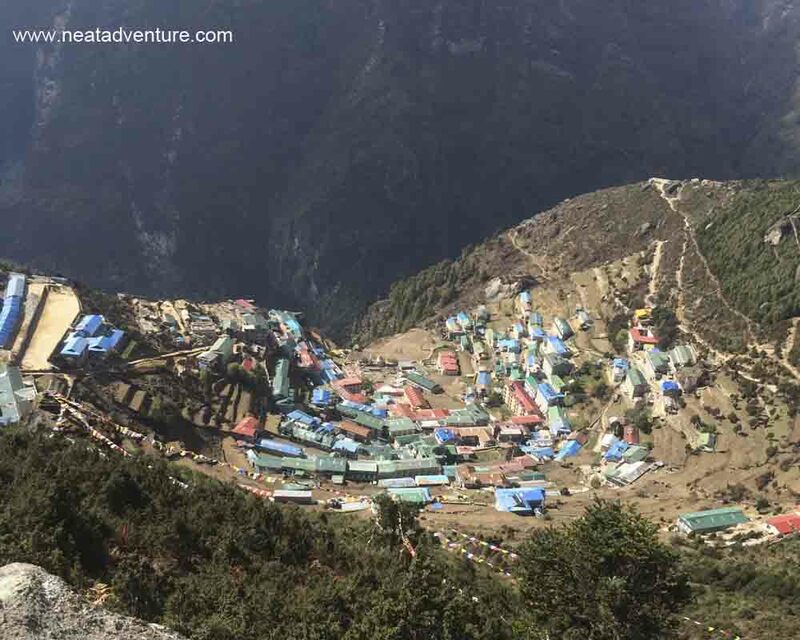 From Lamjura top we climb down to Junbesi via Tragdobuk then to the attractive Sherpa village of Junbesi at 2675m. Overnight and dinner at guesthouse. Juni-Benshi to Nunthala 2220m, 7 hrs This day, we ascend up to 3080m, from where Everest become visible in front of us, From Junbesi the trail follows to Phaplu and the district headquarters and Salleri. From Salung, we descend to the Ringmo Khola & we make a short climb from Ringmo khola bridge that takes us to the 3080m Takshindo pass, We will have lunch at Ringmo then the trail drops down from the Taksindo pass the monastery of the same name, on to Nuntala. Overnight and dinner at guesthouse. Nunthala to Kharikhola 2075m, Gomba Danda 2190m 6/7 hrs The trail continues descending to the Dudh Koshi where the trail ascends through rice field, several Sherpa villages and forests then reach to Khari Khola. And further an hour climb for Gumba danda overnight at guesthouse, on full board meals. Kharikhola/Gomba Danda to Surkhe 2290m/Chheplung 2800m 7/8 hrs We start a day with a ascending towards Puiyan through Sherpa villages and a forest passing through a narrow gorge about an hour before Puiyan. We will have lunch at Puyan & then descend to Surkhe and if you could not get to Chheplung then can stop at Surkhe or Chauri Kharka as well. Chheplung is the meeting point people who starts trek from Lukla & way to Jiri. Overnight,dinner and breakfast at the guesthouse. Surkhe/Chablung to Jor-salle 2740m, 6 hrs Today we start at Chheplung, from where we head up the valley, beside the Dudh Kosi, to Sagamartha National Park. We continue our journey through the upstream along the riverbank. Overnight, dinner and breakfast at lodge. Jor-salle to Namche 3440m 4 hrs We keep on our trek through the upstream along the riverbank to the meeting of the Bhote Kosi and Dudh Kosi where we have to cross Hilary bridge. We follow up ascending to Namche Bazaar. On the way of climbing, it gives us a chance for incredible photographic opportunities as the peaks of Everest (8848m), Lhotse (8511m), Nuptse (7879m), Ama Dablam (6856m) and Taweche (6542m) come into view for the first time of the trip. Overnight at Guest house, including dinner and breakfast. Acclimatization Day As the climate here is so unpredictable and cold so, you should be physically and mentally prepare to face it. After breakfast you will move towards Everest view Hotel/Khumjung. We have to go above Namchebazaar and pass through Syangboche. From the top of hill above Syangboche you will get view of world highest peak,which most & world famous Mount Everest,Tangboche peak (6367m), Lhotse (8414m), Ama Dablam (6856m) & many more others. After reaching to Khumjung you can visit school established by Hillary. We will start next trek after having lunch passing the foot path of Khimde. After having good time here you will get back to Namche. Overnight at guest house on full board meals. Trek Namche Bazaar to Tengboche 3860m, 5 hrs It is easy to get to Tengboche as the track is flat and we head to Dudhkoshi valley at Punki Thanka. Then we have to climb for Tengboche monastery, known as the spiritual centre of Khumbu. From here we can see awesome view of Mt. Everest, Mt. Ama Dablam on a clear day and other peaks. Overnight at guest house inclusive of full board meals. Tengboche to Pheriche 4410m, 5 hrs To reach to Pheriche we need to descend through a beautiful forest and then after crossing Imja khola, we will pass through the village of Pangboche. We will reach Pheriche known as the windy valley. Overnight at guest house inclusive of full board meals. Rest Day (Optional climb to Kailash Danda or hike to Chhukung valley) Nagarjun is a hill located on the flands of the Chhukung valley directly above Dingboche. After breakfast we will head to Nagarjun. It may take about 5 hrs to reach Nagarjun. From Nagarjun we can see beautiful view of Lobuche east, Lobuche west, Lobuche peak, Thamserku, Kangtega and Amadablam. We could even see Makalu, the world’s fifth highest mountain. Then we will descend back to Pheriche. Overnight at guest house. Trek to Lobuche 4990m, 5 hrs (Optional of resting for one more day at Thukla for acclimatization) We have to trek along a broad valley floor to Dungla. Main specially of Lobuche is Yak pasture, with beautiful sceneries of mountains. Overnight at guest house inclusive of full board meals. Trek to Everest Base Camp 5364m and back to Gorakshep 5140m,7/8 hrs for night We have to climb through meadows and moraine stones steps then reach to Gorakshep,either climb to kalapathar or continue heading to Everest base camp. 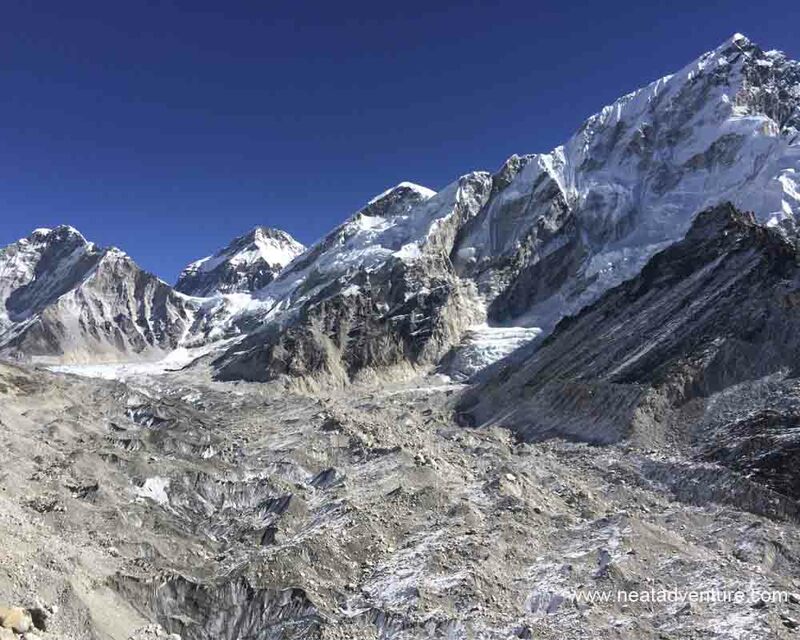 We recommend you go to Everest base camp after you arrive at Gorakshep. From Everest base camp you will not be able to see Mount Everest but you can have a good view of Khumbu Glacier and icefall. Base Camp is the beginning of Everest expeditions. Overnight at a guest house with fullboard meals. Trek to Pheriche. (Optional hike to Kalapathar 5550m for a majestic view of Mt Everest7 hours walk) Wake up early morning and have your breakfast. After breakfast, hike to Kalapathar. From here, we can see the entire south face of Mt. Everest and peaks around & skyline of Tibet. Same day we will descend back to Pheriche. Trek to Namche Trek back to Namche about 6 hours from Pheriche and accomodation at Namche with dinner and breakfast. Trek to Lukla Trek continuously back to Lukla along the Dudh Koshi river about 7 hours from Namche, Lunch at Phakting and overnight at Lukla with dinner and breakfast. Flight back to Kathmandu After having breakfast in the morning we will head towards Lukla airport for scenic flight about 35 minutes to Kathmandu and transfer to Hotel for overnight inclusive BB. Free Day At Kathmandu/Departure-This day, you can enjoy free day at Kathmandu or depart for your home or other destination. It would be easy for you if you have your own group if not also we can arrange a group trek according to your request. You would be joining the group in Kathmandu. If you want to have a solo trip then we are always ready to help you again with single supplement charge. We try our best to make your holiday comfortable in the beauty of Everest region. Trekking guide are very responsible person who will assist you in your whole trek. They have a very broad knowledge about geography, Flora, Fauna, culture, himalayas and trails. Trekking guide will assist and brief all your questions and confusion during trek. The company will provide you the best and authorized guide to make your holiday. Potters are very strong and poor Nepali people who will carry all your baggage wherever you go. Don’t Forget to tip them for their service . Climate in Nepal is diversified depends on season. From the low level to highest point of the World, it start from hot to cold region from South to North. You can travel Nepal in any season but the best time to visit in Everest region is autumn & spring. If you are in autumn the weather is perfect and sky is crystal clear but in spring the weather seem little cloudy but the full blossoming Rhododendrons are awesome. In Summer visibility is poor and there is less chances to see the himalayas and in winter it is very cold in mountain but still possible to do this trip. Before you travel to Nepal please check your passport and validity date. Passports must have at least 6 months validity after finish date of your trek. During booking, it is necessary to send us the passport copy. To travel in Nepal, you will require a visa which you can obtained from Nepalese Embassy at your country or you can get on arrival visa at the TIA airport in Kathmandu (Peak season you need to wait long queue in airport during the obtaining visa).